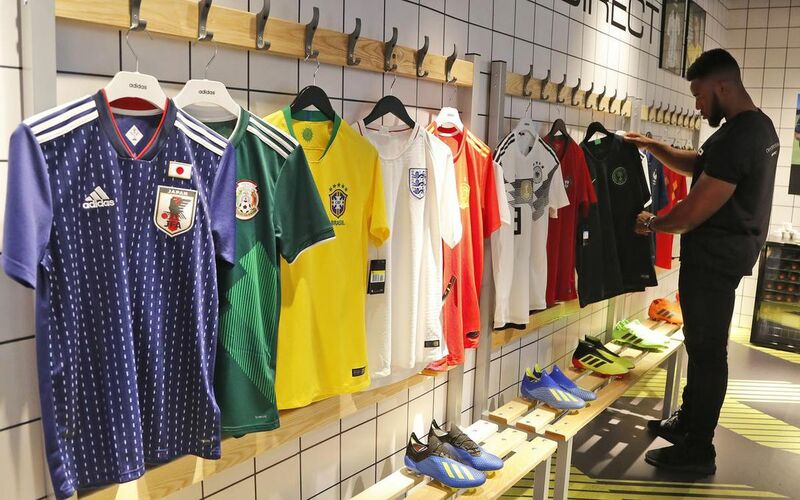 The advance of three unfancied teams (Croatia, Belgium and England) to the World Cup semifinals has offered up its own test to the sportswear giants Nike Inc. and Adidas AG: How they’re coping with the shift to fast fashion. Both companies face increasing competition from upstarts who aim to cut the time it takes to conceive, design and manufacture sportswear. In response, they’ve accelerated efforts to mimic the approach. Nike calls it, in a wince-making sports analogy, the “Triple Double” strategy: twice the innovation, twice the speed and twice the direct connections with customers. It wants to double sales from digital channels to 30 per cent of revenue by 2022, which means it will need to be far nimbler in responding to changing demand. Adidas targets e-commerce revenue of 4 billion euros ($ 4.7 billion) in 2020, or about 15 per cent of estimated sales for that year. In the classic approach to manufacturing sports gear, it can take a year from a jersey’s conception to its arrival in stores. Additional orders still need a lead time of several weeks. But by using direct sales channels such as websites, manufacturers can gauge demand more accurately and respond accordingly. They can also increase the profit made from each item. A third-party distributor such as Sports Direct International Plc doesn’t take its cut. Side-stepping these store chains with e-commerce could increase profit margins on team shirts by 13 to 14 percentage points, according to MainFirst Bank AG analyst John Guy. That could theoretically sustain the higher costs of manufacturing locally in regions such as Europe, making it easier to get the products more quickly to local consumers — an approach being pioneered by new sports merchandise outfits such as Fanatics Inc. In the old model, manufacturers often have to estimate months in advance of a tournament how many jerseys they’re likely to sell for each team, and send the order to plants in Asia or Latin America. Which brings us to this year’s tournament. The semifinalists were France, Belgium, England and Croatia — all decent teams, but only France would have been considered as a possible winner before the tournament. That surprise factor has created an unexpected surge in demand for those teams’ jerseys. Shops are now pretty much sold out of England home jerseys, as are Nike.com and Fanatics’ Kitbag.com — where only small or extra-extra large shirts are available. A popular England training jersey that retails for 47.99 pounds ($ 83) is listed on eBay for more than twice that. It’s a good indication of how far Nike, which sponsors three of the teams, still has to go on the fast fashion front. Adidas, which kits out the Belgium team, is harder to gauge. But with a population of just 11 million (versus 53 million in England and 67 million in France), the sportswear firm’s Belgian online store is sold out of three sizes of the Belgium home jersey, and all of the away jersey. The sportswear giants might be trying to embrace fast fashion, but they’re not exactly running at Kylian Mbappe speed yet.